We’d love your help. Let us know what’s wrong with this preview of Partial Stranger by Barbara Morgenroth. A couple who should have been together forever calls it quits. An uninvited visitor arrives and turns life upside down. An interview has surprising ramifications and, days away from the Miry Brook Hunt Club show, Greer and Talia take a trip. There is more excitement at Miry Brook than anyone counted on and a resolution to a long-standing issue. To ask other readers questions about Partial Stranger, please sign up. So many surprises at Bittersweet Farm. Everyone is getting ready for the Miry Brook Hunt Club show. Talia and Greer take a very interesting trip to England where Talia sees how Greer lived for a few years. She also gets to meet Victoria's parents. The sense of family becomes much more evident as things change. Relationships are changing for several couples. Another wonderfully written book by Barbara Morgenroth! Once again Barbara Morgenroth has written a wonderful book with accurate equine facts. One of the reasons I'm such a fan is because any age horse lover can read her books. Not only is the story engaging from the first page and the characters are relatable, but you learn something from every book. So excited for her next one! 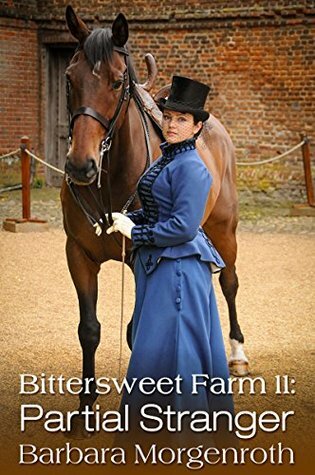 As the Bittersweet Farm team preps for the Miry Brook show, Talia and Greer rush off to England to deal with family matters at Greer's family estate. The story was engrossing and so eloquently written that I wound up highlighting and sharing several passages. The characters continue to grow and evolve, and the story ends too quickly! I can't wait for the next book! I felt like this was one of the slower moving novels in the Bittersweet Farm series. It jumped around a lot. Some parts of the novel seemed unnecessary or under developed. I am still very much a BSF fan, though, and look forward to the next Talia & Greer adventure. I have loved reading all the Bittersweet Farm books. This one is no exception. A continuation of the series done in a well thought out manner.